We need help for 2018! If you know of any students, graduates or volunteers, please pass this link along to them! We need help for the long-term season (12 weeks) and short term volunteers as well (especially local residents). 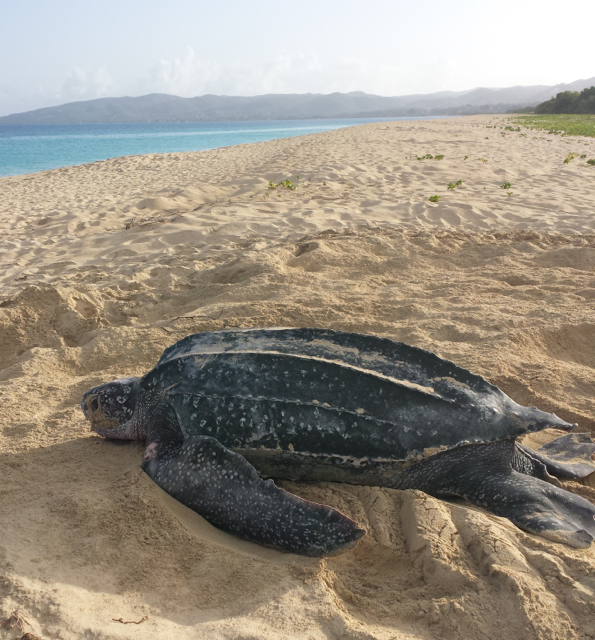 The US Fish and Wildlife Service in collaboration with The Ocean Foundation is recruiting volunteers for the 2018 leatherback sea turtle nesting season, which runs from mid-April through mid-August. Sandy Point National Wildlife Refuge (SPNWR) is located on the beautiful island of St. Croix in the US Virgin Islands. The leatherback sea turtle project began monitoring and management activities at SPNWR in 1977. The Project has since developed into one of the most comprehensive, long-term sea turtle research and recovery efforts in the world. This work contributed to the creation of Sandy Point National Wildlife Refuge as the first refuge in the US Fish and Wildlife Service Refuge System established for the purpose of protecting endangered sea turtles. Dates: Between 1 April and 15 August 2018, minimum of 12 weeks for this call (see the bottom of the page for short-term volunteers). Duties: All training will be provided. Perform regular nightly beach patrols of the 3.0-km beach every 45 minutes to intercept all nesting turtles. Patrol from 7:30 pm until 5:15 am. Tag nesting turtles with external flipper tags and internal PIT tags, collect genetic samples. Track the frequency and distribution of nesting activities by recording date, time and beach location for each activity. Relocate nests deposited in known beach erosion zones to stable beach areas. Protect hatchlings from emerging nests. Excavate emerged nests and collect data on hatch success. Maintain project equipment and vehicles. Maintain and clean communal housing. Perform data entry and error check; summarize data and prepare reports. Participate in outreach activities in the community and on the refuge as needed. Participate in refuge activities related to hurricane assessment and recovery. Requirements: Optimal physical fitness required for walking ~10 miles each night in soft and wet sand, carrying a 25-lb backpack. Willingness to work when required (some weeks will be longer than 40 hours). Turtle experience is not required but would be helpful. Night fieldwork experience preferred, over an extended amount of time (not one or two nights). Patience to endure extreme outdoor conditions such as inclement weather (heat, humidity and rain), noxious insects (sand fleas and mosquitoes), and frequent changes in plans. Ability to work independently when required and as part of a team for the entire season (12 weeks minimum). Enthusiasm and a positive attitude as field conditions vary daily and are unpredictable. Ability to live communally in shared housing in close quarters. Local applicants (US Virgin Islanders) are strongly encouraged to apply; regretfully we cannot accommodate any international applicants at this time. To apply, submit a cover letter detailing how you meet the requirements, include a brief resume and three references (with contact info) to Claudia Lombard and Kelly Stewart at SandyPoint.Leatherbacks@gmail.com. Deadline for applications is Thursday 9 November 2017. Benefits may include: Round trip airfare reimbursement, food expenses subsidized, shared rooms (with two roommates), and transportation for work. Opportunities for independent study are possible. SHORT Term Volunteering – If you are interested in short-term volunteering, or 1 day per week etc., please email us with your interests at SandyPoint.Leatherbacks@gmail.com. Our team removes debris that will prevent turtles from nesting successfully! Two new nesting turtles this week! I’m a teacher and would only be able to work the summer. Is that a possibility? The positions advertised are for 12 week minimums.